There is nothing easier than using your shopping cart - on the product page of the game you wish to buy, you can find a friendly green button called Add to Cart. Once you add the game by clicking the shopping cart, you'll be taken to the checkout automatically. Here you can either pay for the game directly or click on continue shopping - we will remember the content of your shopping cart. How can I buy a game twice? 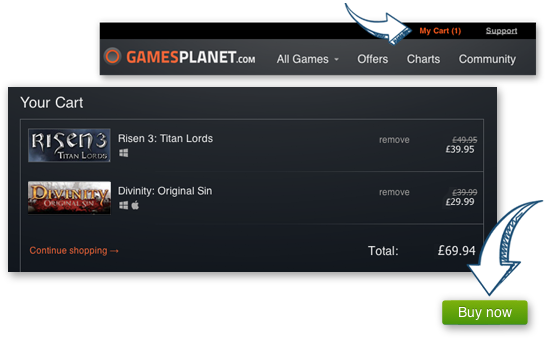 To avoid accidental duplicate purchases you can't add the same game to your cart more than once. However you can just purchase it again straight away after you've bought it.